I am excited to have a booth again at the York Rubber Stamp and Paper Arts Festival on October 12 and 13. We will have "Make and Takes" available throughout each day. We will also be teaching a class using the CTMH Base and Bling Jewelry line on Saturday from 2-4PM. 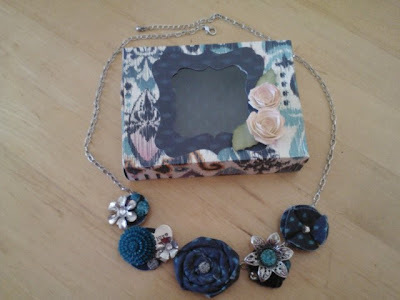 You will make a beautiful necklace and a matching box. This will make a great gift for the upcoming holiday season. Please email me to register for this class. Space is limited. If you visit the show, be sure to stop by and say hi - I will have a gift for you! If you plan to come to the show and would like to pre-order the new Artbooking cartridge, just call or email me ASAP or by September 30th. You will be eligible for the September Special as well. You can get the Artbooking Cartridge, the September Stamp of the Month and the National Stamping Month Special for just $114.00 (plus tax and shipping)! That is almost $200 value for only $114. This is the National Stamping Month Special: " You Are My Happy" It contains THREE stamps sets that you can purchase for only $10 with any $50 purchase. This is a GREAT DEAL!!!! Don't miss out - this offer expires September 30th.